Ruenthip Residence Pattaya i Pattaya, Thailand: Reservér nu! Ruenthip Pattaya, one of the only budget Hotel in Pattaya offering standard quality room with the spectacular sea-view overlooking the Gulf of Thailand at the most competitive price (in Thailand). Ruenthip Pattaya provides very clean room, bathtub and private balcony. Conveniences such as free Wi-Fi in all private and public areas, free fresh cup of coffee in the morning and free shuttle bus service to nearby attractions are included. Inspired to be the mix-used development project, the owner maintain this 140 guestroom and have been welcoming Thai and foreign visitors over the years with warmth and welcome Thai Hospitality at the most affordable price. 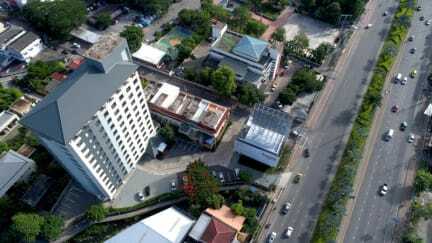 The building was one of the well-known real estate land mark in Naklua district over the past 30 years. Relaxing in the local fishing village called Naklau district in Pattaya with temptation to take a day trip or shopping seafood, leaving guest with the comfort of home. 3. Payment: Cash or credit card (Visa, Master, Amex) is welcomed upon arrival. (2) 1 night room charge per booking is requested after cutoff date (subject to hotel's availability). 6. No smoking in guestroom but we have all private balcony in every rooms.